Tbilisi, Georgia today Russia invaded the small caucus state of Georgia. 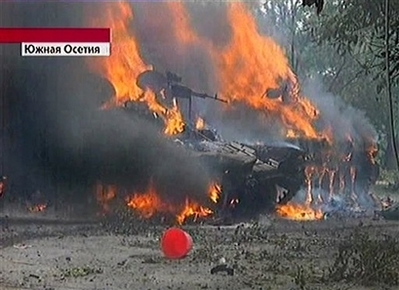 Tanks have rolled in and aerial bombing of the region of South Ossetia has begun. South Ossetia is a Georgian province which has been claimed by Russia as their own. Recent violence in the region has prompted the Georgian military to crack down on the rebels and Russia responded in kind. Believing that this was their land the Russians moved to “defend” their land. “We have Russian tanks on our territory, jets on our territory in broad daylight,” Reuters new agency quoted him as saying. 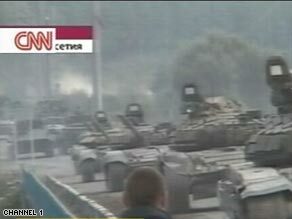 The Russians have said they are sending in troops to reinforce their peace keepers in the region. Russian President Dmitry Medvedev is promising to defend Russian citizens in South Ossetia. Georgia has been on Russia’s bad side especially since Georgia is on it’s way to join NATO which is seen as a threat to the Russians. Do you think this troop movement is justified? Should we answer Georgia’s call and defend our close friend and ally? This entry was posted on August 8, 2008 at 9:05 am and is filed under Asia, International News, War. You can subscribe via RSS 2.0 feed to this post's comments. Any troop movement in interest of the Great Russian Imperialism is justified, You petty pindos. If you look at any credible news reports in the American, European and Russian media they will tell you the hostilities were initiated by Georgia. They attacked the capital of their break-away province South Ossetia, in the process killing 10 Russian peacekeepers, wounding 30 and capturing others. Russia had already stated they would not stand aside if Georgia were to attack South Ossetia and Russia is keeping it’s word. Can we not forget that in the end Russia invaded sovereign Georgia territory?